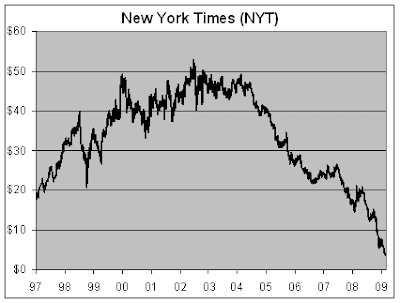 I posted about the disproportionately dramatic fall from grace of the New York Times several days ago. Apparently, their market worth has continued to plummet to such an extent that their Sunday paper is worth more than one of their stocks. You'd think they'd take a hint and get back to the basics of real journalism, but it seems they're resolved to go down with the liberal ideological ship. Shares of NYT (NYT) dropped 29 cents today to close at $3.77. The Sunday paper goes for $4 at the newsstand. Maybe they could save costs by printing the paper on their stock certificates. they should give away a free share with each Sunday paper purchase...but then again who would want to own any of that liberal nonsense. good riddance.